Through cross-strait collaboration, this year’s annual InnovateAsia Design Competition was hosted in the capital of China, Beijing, in Tsinghua University. 800 teams, formed within electronic/electrical engineering majors from various universities, participated from both China and Taiwan. The students underwent half a year of preparation, several rounds of elimination, until five teams were chosen from each side. 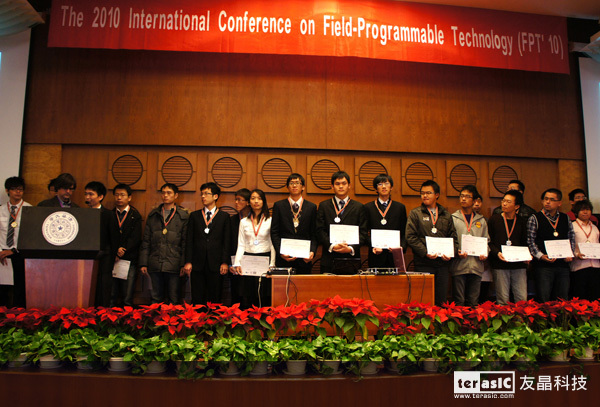 These final teams then proceeded to participate in three days of judging during the International Field Programmable Technology 2010 Conference. During the lengthy couple of days of judging, the top ten teams were required to successfully exhibit their projects, while also presenting in English and describing their works in detail and answering questions to nearly one hundred experts and students. On the scene, the students’ proficiency in English, industry knowledge, and hands-on demonstrations deserved the utmost admiration. One of the key judges, Peter Anthanas, a professor from Virgina Tech, mentioned more than once that if these students ever sought overseas education, he would provide full scholarships and welcome them with open arms! The top five teams from Taiwan included projects U-Keyboard and VisualSonic Studio , headed by National Taiwan University Professor Shaoyi Jian, attracted much attention. 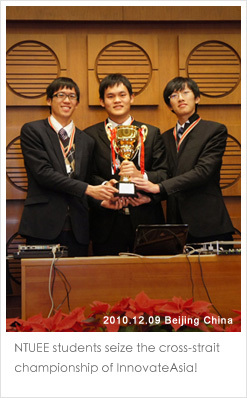 With the top team from Beijing Tsinghua University alongside them, it was a neck-to-neck multimedia race. In addition, considering that fifty percent of the winning vote comes from the participants of the FPT conference, these teams presented their works to perfection with full force. 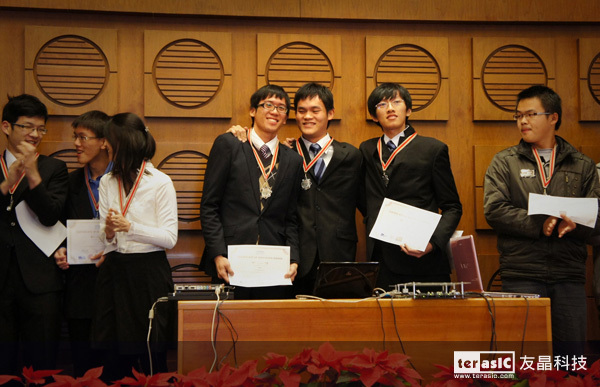 The final cross-strait champion team included National Taiwan University’s Po-hsuan Chen, Ku-Chu Wei, Hsio-yuan Liu with their project VisualSonic Studio (an intuitive DJ control center) , which received an overwhelming number of votes from judges to grant them the final position of first place! When the champion team was announced, the talented students from NTUEE hugged and thanked each other for mutual support. With the handing-over of the championship cup from University of Toronto professor Stephen Brown, the audience gave a standing ovation. Team leader Po-hsuan Chen, was lauded by foreign judges for his exceptional English ability. Chen expressed that this competition gave him a chance to present his work, a product of relentless work in the laboratory, to foreign experts in an interview with a famous Chinese electronics publication, “Applied Engineering Technology.” It was also the first opportunity for him to network with mainland counterparts. One of the prime reasons for his success, Chen said, was also due to the support from teachers and industry seniors! Hubei Winning Team–Globular Fruits System based on SOPC Technology–assembling their apparatus. NTUEE Student Ming Hsiao introduces their project U-Keyboard to University of Toronto professor Dr. Stephen Brown. The top ten teams from cross-straits receive their prize while waiting announcement for the final winner. Po-hsuan Chen, Ku-chu Wei, Hsio-yuan Liu celebrate as their name is announced as the winning team! 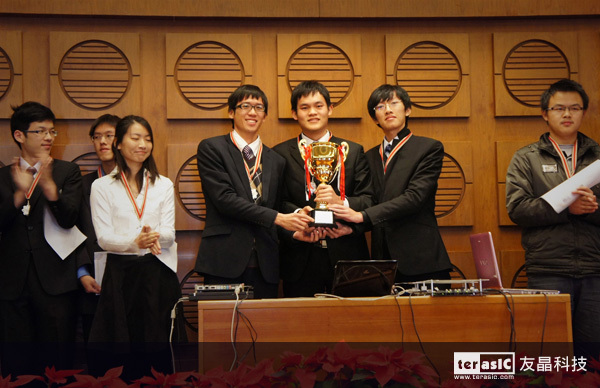 NTUEE students seize the cross-strait championship of InnovateAsia!